This is what happens when BMW takes it’s most beautiful car and injects it with steroids. The BMW E9 is a ledgend that needs no introduction. When the German auto maker wanted to take it’s car racing in 1972, they stripped out the interior, soundproofing, and replaced the cars glass with plastic. These cars were dubbed 3.0 CSL, the L for lightweight, if you didn’t know, and sold to the public to meet homogolation requirements. The following year, BMW turned things up to 11 and added all kinds of aerodynamic go-fast bits. This meant a aggressive chin spoiler, find on the front fenders, a spoiler off the back of the roof, and a huge wing off the rear. Fun Wikipedia fact: the rear wings were not attached when the cars left the factory, but were included in the trunk because road cars weren’t allowed to have such big wings in Germany. Affectionately nicknamed the Batmobile, these monsters tore up the track in full blown race mode. These body modifications helped lead to BMW’s victory in the European Touring Car Championship in ‘73, and then again in ‘75, ‘76, ‘77, ‘78, and ‘79. Yeah, that’s a lot. But enough about the car, you guys are here to read about this model. 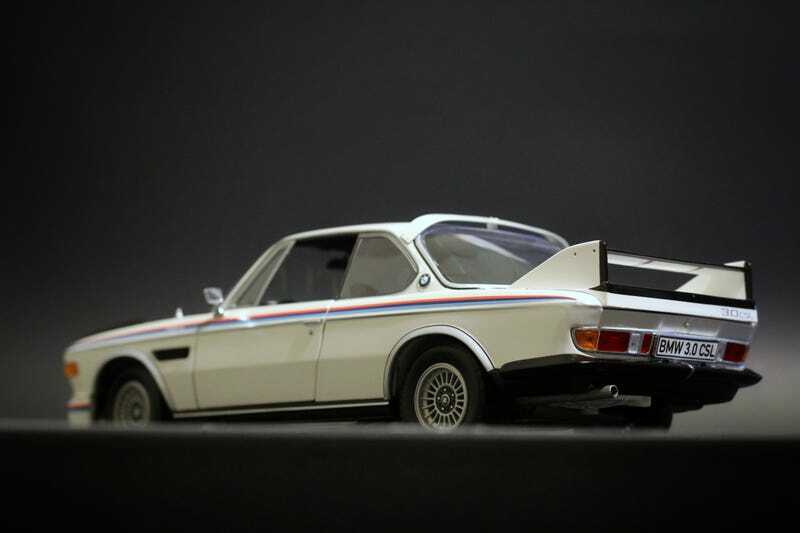 Build by Minichamps, this model is actually part of the BMW dealership line marketed as the Heritage Collection. In fact the only way you’d know its a Minichamps is if you flip it over and read the base. The engine bay boasts a wonderfully detailed compartment with lots and lots of color. Each component is its own piece, not one lump of molded plastic. Engines were once beautiful by themselves believe it or not, unlike the cars of today which keep everything hidden with plastic covers. The interior hosts all kinds of goodness. A wooden dash with real in-laid gauges highlights it all. The steering wheel looks killer, and a wooden shift knob really pop as well. Oh yeah, and there’s carpet! Even the trunk gets the detail treatment with carpeting and the hinges actually look halfway decent too. All of the details on the body of the car are excellent too. There’s hood pins, well executed vents, and the wheels and tires look amazing. I’d tell you my complaints if I had any, but honestly, I’m 100% satisfied with this model! I forget, but I think I picked this up on eBay sometime last year for around $90. I have seen a BMW dealership on eBay list these Heritage models regularly for $65, but they tend to sell out quickly. NEW MODELS FROM OTTOMOBILE FOR MAY AND JUNE!